This is one of the amusing releases from Carlton Ware in their 'Walking Ware' series. 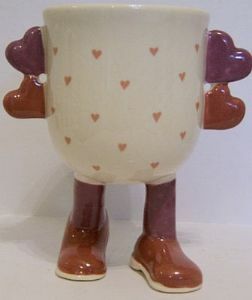 This one is the 'Valentine Cup' . Designed by Roger Michell (Lustre Pottery) for Carlton Ware, this particular piece is the relatively 'hard-to-find' drinking cup. It has pink and purple hearts scattered around the body with solid purple handles in the shape of two hearts. It has purple shoes with a lighter lilac shade for the socks. There is light crazing on the exterior but none inside the cup itself. There are no chips/nibbles nor restoration work. The underside of one foot is backstamped with also Lustre Pottery 1980. The overall height of the Egg Cup is 5 inches (13 cms) approx. UK postage is FREE and overseas postage is always sent by 'Signed For' service.